The experienced M&E company completed one of only two projects in Northern Ireland that have used Powrmatic NVS condensing gas suspended unit heaters – a fact that again cements the company’s relationship with one of Europe’s leading manufacturers of industrial and commercial heating equipment and bespoke ventilation equipment. 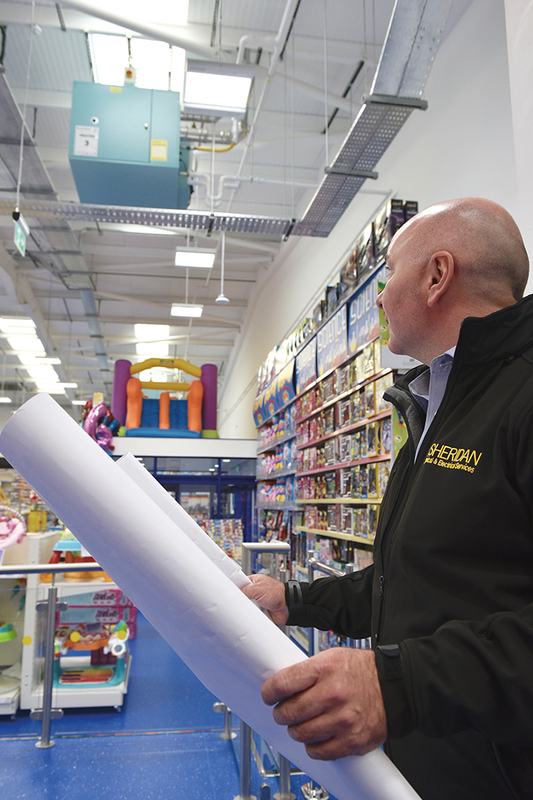 Eddie Allan, Sheridan M&E, surveys the Powrmatic NVS condensing has suspended unit heater, installed at the new Smyths Toys in Newtownabbey. “We are the main agents for Powrmatic in Northern Ireland and we are delighted to have been involved in another scheme that showcases the many benefits of using this high quality range of products,” explained Eddie Allan, Sheridan M&E. This project highlights the high standards that Sheridan M&E deliver. The Sheridan name has been synonymous with heating since 1968 and the company offer the complete package – from the initial survey and design of a system through to the installation (including electrical and mechanical works), commissioning, service and repair.